ASUS is one of the premier motherboard manufaturers, it is one of a handful of companies that enthusiast keep an eye on for new technology. As Intel is releasing a new processor, a new motherboard chipset comes along with that. The Intel Z270 includes a number of enhancements for 4K video, new storage devices such as Intel Optane, and more. Most manufacturers will release a handful of motherboards designed to fit a wide range of users. ASUS is preparing six Z270 motherboards for the initial launch of the chipset. These motherboards are expected to range in price from $164 up to $379 at launch. 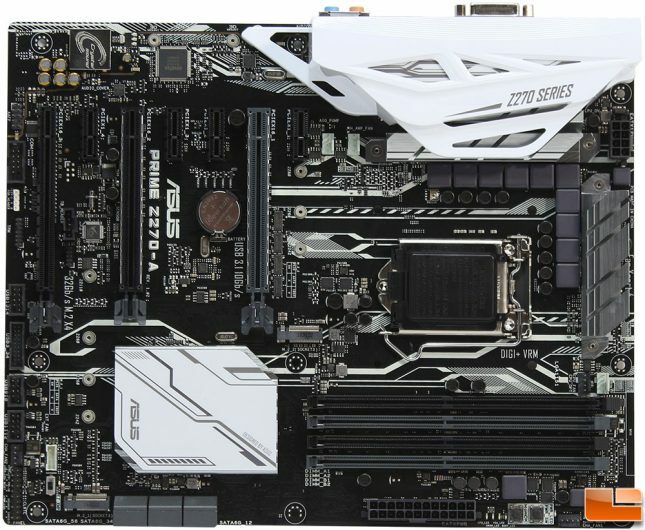 Today, we are getting a chance to take an early look at the Prime Z270-A motherboard, which is expected to have an MSRP of $164 with a 3 year warranty. This puts it at the low end of ASUS’s Z270 line-up, however that doesn’t mean that they skimped out on the features. Here is a quick look at the ASUS Z270 motherboard line-up at launch. As we can see, the Prime Z270-A will be at the low end of the motherboards, however that doesn’t mean that ASUS has skimped out on features. Also, we should note that the ROG Maximus IV Formula is listed with a $379 MSRP, however ASUS expects that will drop by time they go on sale on January 5th. It includes most of the storage options available with support for six SATA 6Gb/s drives, two M.2 (both SATA and PCIe) with support for Intel Optane, and multiple USB 3.1 connections. Video options range from on-board graphics supplied by the latest Intel HD Graphics with HDMI 1.4a, DisplayPort 1.2 and DVI-D. This also includes support for Intel InTru 3D, Quick Sync Video, Clear Video HD Technology and Insider. However most enthusiasts will look at adding in a dedicated graphics card, which the ASUS Prime Z270-A supports 2-Way NVIDIA SLI or 3-Way CrossFireX. Storage and graphics options aside, there is a lot more to the Prime Z270-A hidden beneath the surface. Separating the audio from the rest of the motherboard has become pretty common, ASUS does this and lights up the audio separation with RGB lighting. 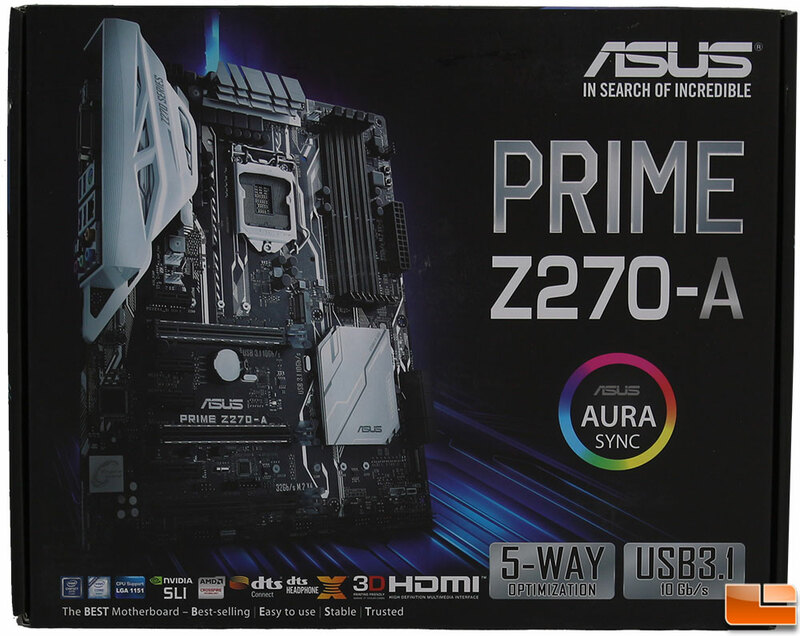 The ASUS Aura RGB lighting system is becoming one of the most popular RGB lighting standards around, the Prime Z270-A includes a connection on the motherboard to support RGB light strips. There is much more to see on the Prime Z270-A, let’s get started with a quick look at the features and specifications, before getting to the motherboard. 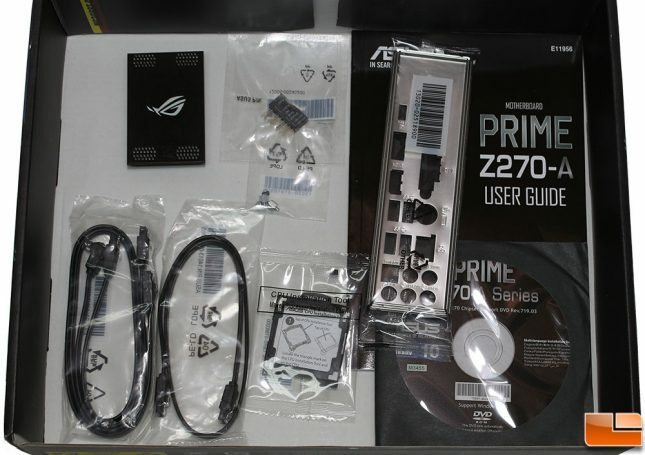 ASUS packages the Prime Z270-A like most motherboards. The exterior of the box presents the key features on the front, along with an overview picture of the motherboard. 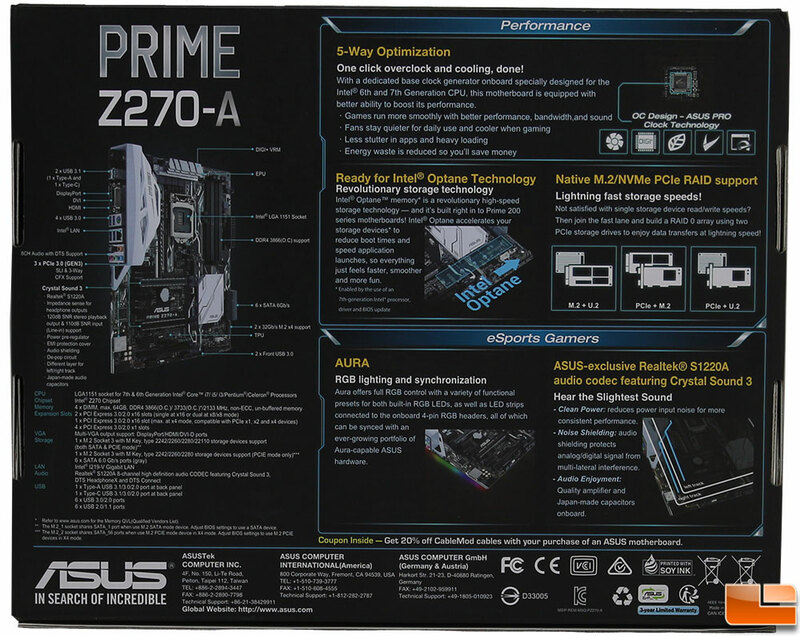 Flipping the box over, the back presents much more information on the Prime Z270-A. Information on several key features such as 5-Way Optimization for overclocking, ASUS Aura, storage options and ASUS exclusive Realtek S1220A audio codec are provided. On the back, ASUS also lists out the other specifications of the motherboard. Opening the lid on the box, we find the motherboard in a standard anti-static bag, packed in the box pretty tightly to help avoid damage while being shipped. Included with the ASUS Prime Z270-A is a fairly standard accessory pack. For documentation, the user manual and a driver/software DVD is included. 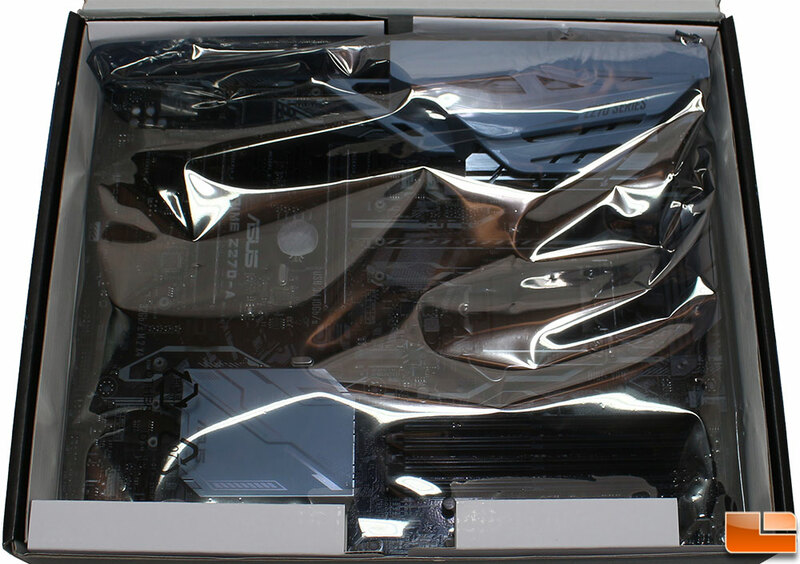 In addition, the standard rear I/O cover shield, ASUS CPU installation guide, three SATA cables, and the ASUS quick connect for the front panel headers. The included SLI bracket is also standard, however ASUS has upgraded it from the “standard” basic flexible model to a heavy duty PCB based model. Lets take a quick look around the Prime Z270-A before we get to doing some testing.